I received this book last December, right before our Royal Caribbean Mariner of the Seas cruise holiday. So after having spent some time reading the book since, here’s what I think. 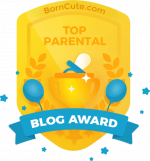 But first, I must clarify that when I read parenting books, there are two things I particularly like – honesty in the tone and a tips/ recap section (having both would be totally awesome) after each chapter. Does this book have both? It does, because Maya Thiagarajan writes from a personal perspective – that of a mother and a teacher who has lived and worked in both the United States and Asia, and has been teaching at an international school in Singapore when she moved here with her family in 2010. And each chapter ends with a “How to” section, offering parents research-backed suggestions to aid their children’s development, both within and beyond the classroom. 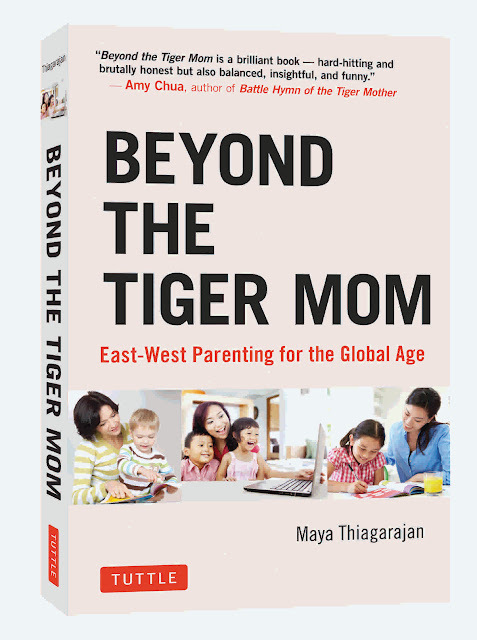 Being well-acquainted with Western and Asian approaches to parenting and education – and their stark differences – she synthesises both in her book, bringing together the best of the East and West. This precedes the TIPS for parents section where she gives practical suggestions (based on research and personal experience) about How to help your child memorize information and How to encourage critical thinking skills. Here’s a snapshot of the content page so you can see that she really does deal with the key areas where the East and West differ in perspectives and philosophies. This is not just a book that offers you insights into differences, but one that shows you how you can make those become strengths and more importantly, get to know your child (and yourself) more in the process. If you like what you see, you can get your own copy from all leading book stores in Singapore. It retails at S$24 (price before GST). Maya Thiagarajan was raised in Chennai India, by her South Indian father and American mother. After high school, Maya left India and moved to the US. She earned a BA in English from Middlebury College and a Masters in Education Policy from Harvard University. Maya started her teaching career at a tough urban public school in Baltimore City and later went on to teach at some of America’s most prestigious independent schools. In 2009, Maya moved to Singapore where she now teaches students from around the world at an international school. Over half her students are South Asian or East Asian, deepening her understanding of Asian family values and Asian approaches to education. Maya has two children aged 5 and 8. Disclosure: I was provided a copy of the book for review purposes. No monetary compensation was received. Oh my gosh, that looks like some heavy reading! To be honest, I’m a trashy novel kind of person. When I’m not reading children’s books, I am reading some brainless fiction. But I guess the strength of this book is in the author’s experience with both Western and Eastern parenting styles. 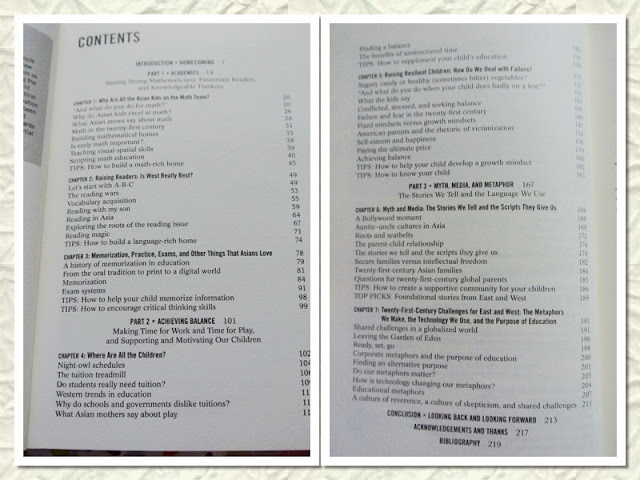 It’s a good idea to show the contents page so that we can decide if any of the topics interest is. I used to read some parenting books but sometimes feel overwhelmed by what’s written. So have you finish reading the book? Thanks for the post. This book seems to be quite good. Have heard some rave reviews. Seems like a serious read. I haven’t been reading for ages and this will be heavy for me. ? I probably end up drawing instead. Nice intro of the author and book though. Phoebe recently posted…KidZania Singapore Opening in April 2016! Thanks for sharing this book review. What was the most striking difference you gleamed between the East and West way of parenting? Thanks for sharing about it, to me it looks like a great read with some deep thought about parenting. I would like to check how east and west way of parenting. I intend to write on ” 5 Things I’ve Not Done Since I Became Mom” and Reading A Book is one of them! 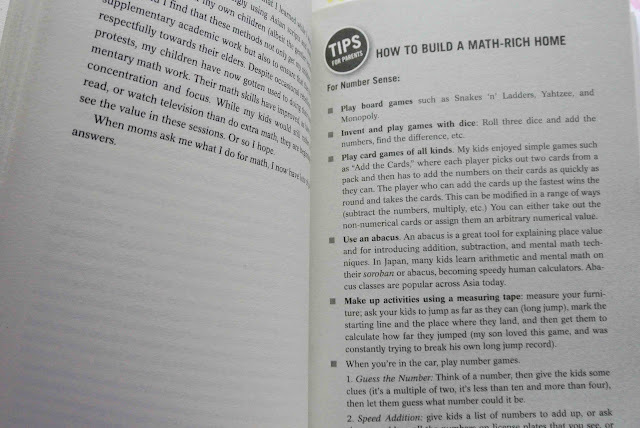 “How to build a math-rich home” caught my eye definitely! Having grown up in a family that runs businesses, my Math is considered bad. And with that, I really have no idea how to inculcate Math in a fun way. I didn’t know playing board games can actually encourage children to count. It’s brilliant!